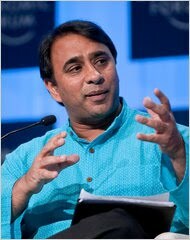 The initial public offering of SKS Microfinace has been well chronicled by the news media in India, where the company’s founder, Vikram Akula, an Indian-American, has become a celebrity. Time magazine put him on its list of the world’s 100 most influential people in 2006, and he was named one of the World Economic Forum’s “young global leaders” in 2008. Not all of the attention has been flattering, though. The disclosures section of the I.P.O. prospectus refers to a long personal court battle involving Mr. Akula. For nearly eight years, he has been embroiled in a custody dispute with his Indian-American ex-wife, Malini Byanna, a lawyer based in Chicago, over their son. The boy, Tejas, now 9, currently lives with his father in Hyderabad, India. An Illinois court awarded Ms. Byanna custody of Tejas in 2002. In a case now pending in the Illinois appellate court, Ms. Byanna has argued that Mr. Akula has improperly held the boy since last year, when he opened custody proceedings in Indian court. At the time Mr. Akula was caring for Tejas, Ms. Byanna was undergoing surgery in the United States. Mr. Akula’s lawyers assert that American and Indian courts have granted him temporary custody until legal cases in both countries are resolved. John Echard, spokesman for the State Department’s bureau of consular affairs, said Thursday, “A child is still being retained abroad, and Ms. Byanna, who has sole legal and physical custody of him, determined by an Illinois court, is still unable to exercise her custodial and parental rights." In a July 14 hearing in Chicago, Mr. Akula’s lawyers appealed a lower court’s decision that India lacked jurisdiction to award Mr. Akula custody. Patrick J. Quinn, an Illinois appellate court justice, said, “This is not a kidnapping,” but he added that the child remained in India in defiance of court orders in the United States. The Illinois court is expected to issue a final ruling on the jurisdiction question next month. The case is also pending in India’s Supreme Court.